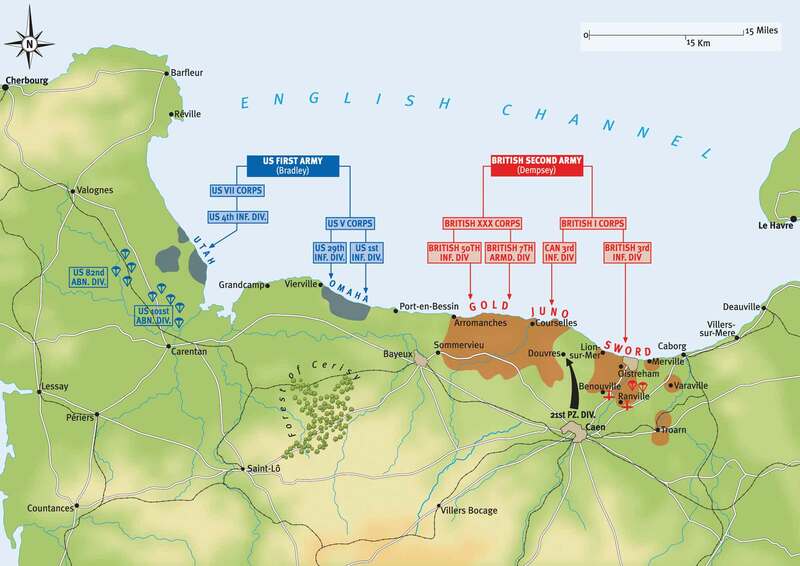 How were tens of thousands of infantry landed on the Normandy beaches on 6 June 1944? How was the supply of ammo, fuel, water, rations, and everything else required by an army of invasion managed on crowded beaches under heavy fire from artillery and machine-guns? How were the beachheads protected from counterattack and given time to consolidate? The D-Day anniversary special in MHM issue 46 looks at the overall strategy and tactics and then focuses on three components of the logistical and military ‘framing’ of the Normandy Landings: the projection of combat elements to the battle zone; the organisation of supply on contested beaches; and the aerial interdiction of enemy communications. The below plan, which features in the 17-page special, details the operations on D-Day, 6 June 1944, showing British and American air-drop zones, the five landing beaches, and the gains made on the first day. Note especially the greater difficulties of the US forces as reflected in their more limited first-day gains. Click image to enlarge. To see a timeline of D-Day events and how they fit into the wider context of Operation Overlord, click here.